Egyptian Muslims are continuing to harass Christians, this time in the central region of the country. Egyptian Muslims are continuing to harass Coptic Christians, this time in the central region of the country. Military personnel intervened in clashes that began late Thursday when several local Muslim taxi drivers allegedly began bothering a group of Christian girls. Eyewitnesses told the daily Al Masry Al Youm newspaper the fighting began in the village of Qolosna, located in Upper Egypt's Minya Governorate. Four Christians and three Muslims were taken to the hospital in nearby Samalout with gunshot wounds, according to security sources. At least 10 people were arrested. 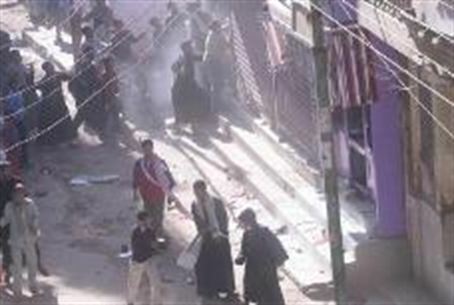 A curfew was imposed as well, beginning right after Friday afternoon prayers. Egypt's Coptic Christian minority comprises only 10 percent of the country's populace. Despite protestations to the contrary, the Tahrir Revolution seems to have done precious little to create a sense of equality between the majority – Muslims – and Christians. As they did prior to the fall of former President Hosni Mubarak, Muslim extremists have repeatedly targeted Coptic Christians over the past several months. Last week hundreds of Muslims surrounded a village church only seven kilometers south of Minya, threatening to murder the local priest, according to the Assyrian International News Agency. The church has been repeatedly targeted since renovation work on the building began in March. Muslims have threatened to demolish the church.